The Strong National Museum of Play in Rochester, New York has announced their 2016 selectee’s for the Video Game Hall of Fame. The Strong National Museum of Play in Rochester, New York has announced the second annual class of their Video Game Hall of Fame. The inductees constitute nothing less than the greatest, most popular, and culturally influential electronic games ever created for any system. The second class includes six major game labels that feature the likes of The Legend of Zelda, Sonic the Hedgehog, and The Sims. The 2016 inductees, like the first inaugural class, spurs legitimate debate over those chosen, as well as those excluded. Here are those that made the big cut, those that came up short, and why they graduated into gaming immortality. The selection process for the World Video Game Hall of Fame is based on several factors. Nominee’s must possess considerable cultural influence, have an iconic status, major international appeal, as well as long term popularity These are the incredible six for 2016. The Legend of Zelda (1986) is the first game of what is a Nintendo franchise stalwart. Zelda was created by Shigeru Miyamoto, and was deeply inspired by his exploration of the wilderness as a child. For three decades and over multiple incarnations of Nintendo systems, the Zelda franchise remains a benchmark in video game popular culture. This past March Nintendo released, The Legend of Zelda: Twilight Princess HD for their Wii U home system, a clear sign of the franchise’s enduring popularity. The Oregon Trail (1971) was created by several innovative student teachers in Minnesota to help tutor children learning 19th century American history. Since the games original release, The Oregon Trail has grown significantly in popularity. Its successor versions were a classic feature of life for countless Millennials during their childhood. Traveling from Independence, Missouri to the Oregon Territory provided many hours of entertainment. The game also taught, among other valuable lessons, that one cannot spend all of their money on salted pork and Brandy. In addition to the beneficial experience of having to decide between forging the river, or paying the ferry toll. The Sims created by Will Wright is the best-selling PC game of all time. The Sims are one of the most widely recognized computer games ever created. Its gaming concept was born out of its predecessor Sim City franchise, also designed by Wright. The Sims proved to be a revolutionary concept, and is self evident for inclusion to the Video Game Hall of Fame. The label’s gaming model has been described as a “virtual dollhouse,” whereby the player completely controls their chosen character and all of its life choices. The countless permutations of possible professional success, entertaining domestic drama, or simply singing in the shower created a serious global phenomenon. The innovative game has been purchased by over 200 million buyers, translated into 20 languages, and is available in 60 countries. The Sims have become a hallmark of everyday life. Sonic The Hedgehog is both a Sega mainstay, as well as a cultural icon. Sonic was originally created to challenge Nintendo’s legendary Mario Brothers, and has accomplished a great deal more. Over 25 years Sonic has lead to the creation of 20 additional games, and related labels. Sonic also stands as Sega’s best selling game of all time. Whether collecting rings, fighting Doctor Robotnik, or tolerating the constant irritation of Tales; Sonic is the epitome of speed, attitude, and cool. 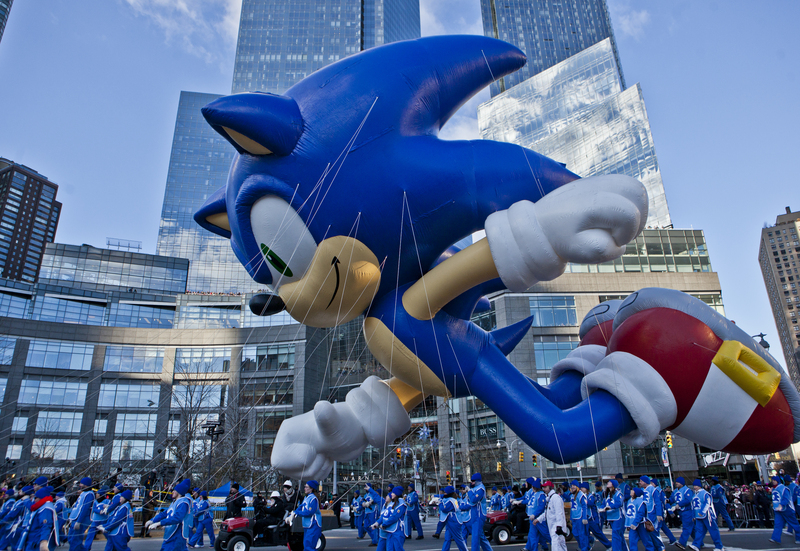 Sonic also became a blimp in Macy’s annual Thanksgiving Day Parade in New York City, the ultimate sign of cultural arrival. Grand Theft Auto III is a British designed and developed 3-D “sand box” style game. A sand box modeled game is designed so that the player sets their own objectives in the game, and achieves those goals within the universe of that game. When it comes to open goals and Grand Theft Auto III, it is nothing less than a guarantee for utter chaos, anarchy, and multiple life sentences. High jacking a car is child’s play in this universe. As of 2015, Grand Theft Auto III has sold 220 million copies worldwide. In giving the player the keys to the car of chaos, a hit was born. Space Invaders was designed by Tomohiro Nishikado, and was originally released in Japan as a stand alone arcade model game. As one of the first games designed to repel an alien invasion from space, it is a standard unto itself. Space Invaders is the proverbial grand-daddy of science fiction thrilling labels. In 1980 Space Invaders was released for the Atari 2600 home console. In doing so, Space Invaders became Atari’s best-selling game in the companies history. It is often credited for generating the immense hunger for arcade and home console game’s during electronic gaming’s infancy. Space Invaders helped create the gaming market that is now taken for granted, and well deserves inclusion to the Video Game Hall of Fame. The following games were considered for introduction in 2016, however were not chosen this year. Elite, Final Fantasy, John Madden Football, Minecraft, Nürburgring, Pokémon Red and Green, Sid Meier’s Civilization, Street Fighter II, and Tomb Raider. The debates are raging on.